This article evolved from an email to the AIR listserv back in March. Questions around levels for podcasts and radio kept coming up, so I sat down one night in the midst of preparing for a move from Minneapolis to Washington, DC, to hammer something out to address them. I ended up with a quick-and-dirty explainer, along with a couple of step-by-step examples for various platforms. What follows is certainly not an exhaustive explanation, but instead an attempt to give those who are curious a little more information. Radio and podcasts need two different loudness targets: -24 LUFS for radio and approximately -18 LUFS for podcasts. It’s best to do all of your production at the lower “radio” level, even if your final product is to be at the higher “podcast” level. To get from -24 LUFS to -18 LUFS, use the steps outlined at the end of this document or use software specifically made for the purpose. The loudness standards for public radio distribution are welcome in that they allow us to define a single target for moving content around the various public radio systems, regardless of its production style. 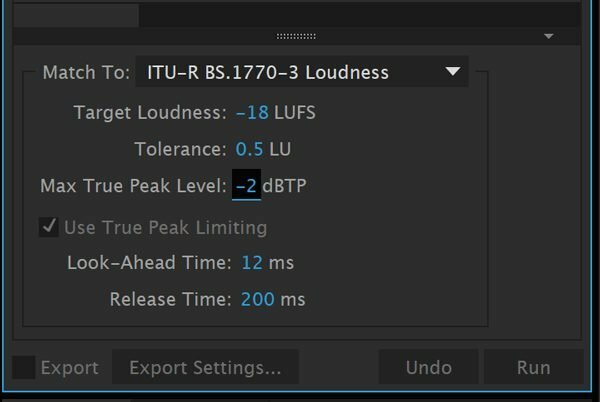 My previous article at Transom, The Audio Producer’s Guide to Loudness, addresses how to achieve the -24 LUFS target used in radio production. The radio standard doesn’t address a loudness target for podcasts… and it’s not likely to. Those of us involved in making that standard were primarily concerned with passing content amongst the distribution points in the public radio system. YES, YES BUT WHY THE HECK ARE THERE TWO STANDARDS? The lower -24 LUFS radio spec allows for a wide dynamic range. That means audio producers can create programming with soft, low-level peaks and louder, hotter-level peaks and everything in between (within good production practices) as long as the overall average loudness is -24 LUFS. Talk radio might not take full advantage of this wide dynamic range, but music programming certainly does, so the folks who made the radio standard had to keep a wide variety of content in mind when they created it. This dynamic range is what allows one producer to have a very compressed and punchy sound while another has a more natural and open sound. As long as they target the same loudness value, in general the two programs will sound equally loud over time. Compounding this problem: when folks listen to podcasts on a mobile device, they are likely on-the-go. Commuting via metro (ahem… subway… I’m a DC boy at heart it seems), bus, walking, whatever. Or they are listening while doing the dishes or driving in the car. All of these scenarios will have loud background noise that competes with the audio. Louder listening environments, combined with a mobile device’s inability to pump up the volume, means we need a higher loudness target for podcasts. Let’s take a Nick Quah-style GIF break, shall we? The possibility for a wider dynamic range in the radio spec works well for radio because every station includes processing before the signal is broadcast over the air. Processing like compressors, limiters, companders — equipment that squashes down some of the peaks, brings up the lower levels, and reduces the dynamic range. This processing helps the signal survive over-the-air transmission, helps it be more audible in environments like the car or the kitchen, and shapes the sound of the station. Each station wants to tailor its sound based on its own tastes and content, and they do that by processing their signal differently than the other stations in their market. One station may prefer a more natural sound (often the choice most public radio stations make), while another station may prefer a more compressed and aggressive sound (typical of Top 40 or commercial talk radio). The public radio loudness standard ensures that each station will receive every program from the distribution system at a consistent loudness. That consistency allows them to fine-tune their processing to their liking and create the sound they want. If the processors are squashing the dynamic range anyway, why don’t we just use the -18 LUFS podcast target for radio production? It would be easier to have one number for everything. Well, a higher loudness target means lower dynamic range and that effectively steals the dynamic range from those producers who want it. There are certainly producers out there (like yours truly) who prefer to have the option of a wider dynamic range when they need it. Music productions especially want that wider dynamic range, but so do some more traditional talk programs like many of the daily news magazines you know and love. Another reason not to produce everything at -18 LUFS is a logistical one. The higher peaks associated with a higher loudness target make it really difficult to produce much of anything without some kind of processing… especially when you are producing live radio! Case in point: if you sat down with your portable recorder and shotgun mic right now and tried to record your voice at the equivalent of -18 LUFS, you’d distort the recorder. To prevent the distortion you’d need compression and limiting in line before the signal reaches the recorder, and that’s before you’ve even gotten a chance to listen to your audio. You’d have to process the sound before it was recorded. That’s not best practice and it would be expensive… no good. Allows for a wider dynamic range for those who want it. Is at a level that is low enough for everyday production without needing compressors and limiters. Ensures stations receive content that is consistent from program to program. Overcomes the limitations of mobile devices. Overcomes the limitations of the environments where our listeners find themselves. 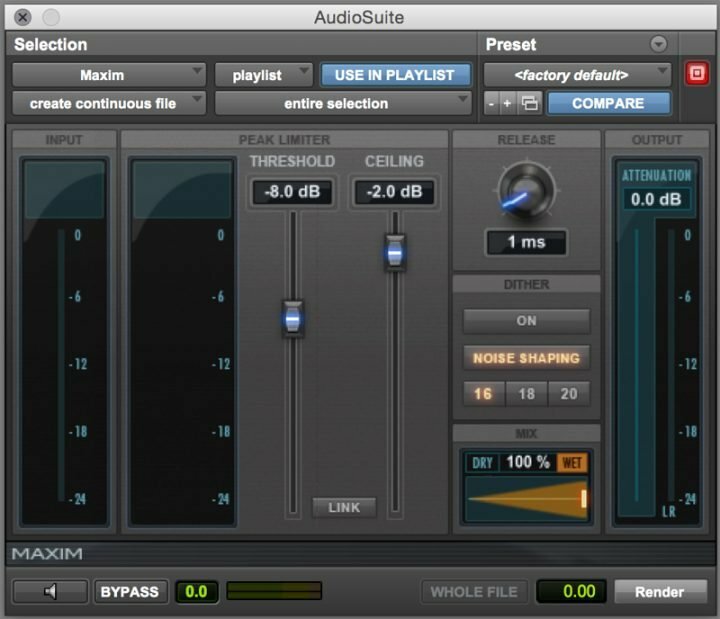 You’ve read The Audio Producer’s Guide to Loudness so you have the tools and know-how to produce content at -24 LUFS (if you need more help, let me know.). That’s great, because as stated before it’s much easier to record and mix audio at -24 LUFS. I recommend doing all of your production (recording, editing, and mixing) at -24 LUFS. Even if your content will never air on the radio, produce it at -24 LUFS first. Once everything is sounding amazing at -24 LUFS and you feel like the mix is done you can convert it to the -18 LUFS podcast target. To convert from the lower -24 LUFS mix to the -18 LUFS podcast target we are going to reduce the dynamic range — reduce the peaks — so that we create room to raise the overall loudness of the file. If we tried to raise the loudness of the file without reducing the peaks, we’d end up with distortion, as many of the peaks would push to 0 dBFS. That’s bad. By managing the peaks first, we give ourselves more headroom — the space between the highest peak in the file and 0 dBFS. We’ll first use a limiter (either manually or via an automated workflow) to reduce the peaks and increase the headroom, then we’ll raise the gain of the entire file (again, either manually or via an automated workflow). Mix to -24 LUFS average. There are a few ways to do this, but I’ll outline some straightforward methods here using commonly available tools. Bounce or export your -24 LUFS mix to a file. Be sure to label it appropriately so you don’t get confused later, because we are going to end up with two files, one at -24 LUFS and the other at -18 LUFS. I typically put “neg24” in the filename of this file. Import your file to a new session or track. 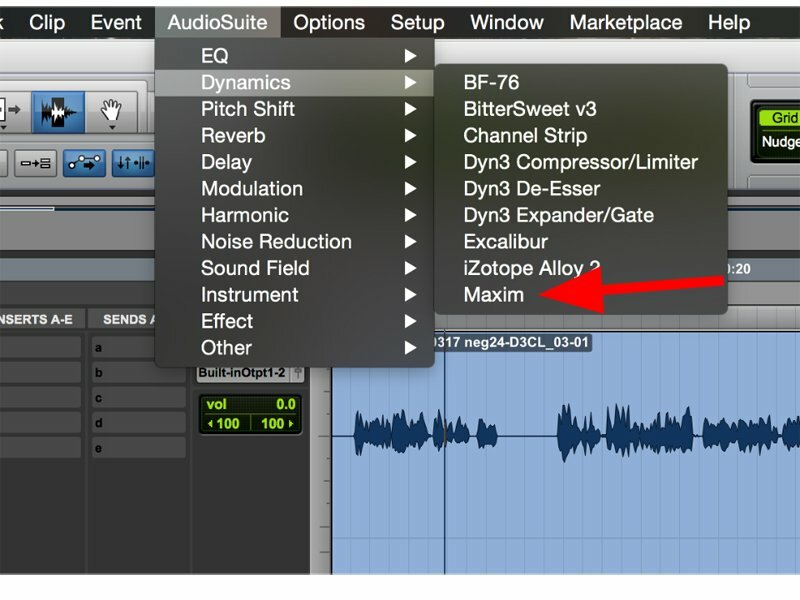 Open the AudioSuite plugin called “Maxim” (see above) (Audiosuite -> Dynamics -> Maxim). Maxim is not a great limiter, it’s a free one that comes with Pro Tools. If you have access to a nicer limiter, such as the Waves L1, or similar, please use it instead! You can probably use the same settings as we indicate in the graphic here, but you may need to experiment a little with the specific plug-in you’re using. Assuming you started with a -24 LUFS mix, you now have an approximately -18 LUFS file! The folks at Hindenburg make this easy. You can simply use an export feature to convert your mix to -16 LUFS. It’s not -18 LUFS, but it’s pretty darn close. Follow this guide. Adobe Audition has a nice feature called “Match Volume” that will do the conversion to -18 LUFS. It’s not perfect — it doesn’t let you fine-tune the peaks, but it does a decent job. Open the Match Volume window. Drag your file from the File window to the Match Volume window. Voilà. You bumped your -24 LUFS radio mix to -18 LUFS for your podcast… AND you didn’t have to change any of your normal mixing techniques to get there. A quick update. It turns out the wonderful folks at Adobe have updated Audition CC since I wrote this article. 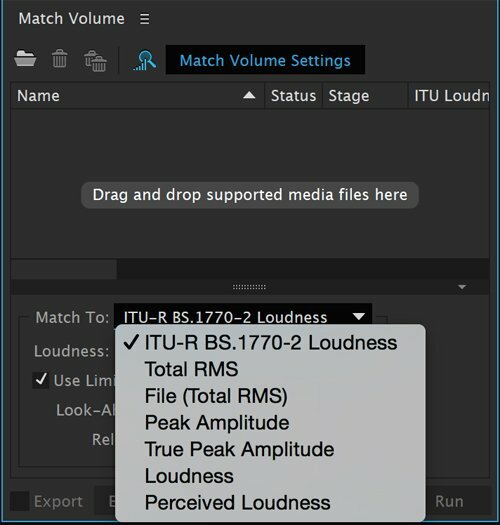 They’ve changed the name of the tool from “Match Volume” to “Match Loudness” AND added a nice adjustable True Peak limiter. It’s perfect for the needs of anyone needing to get a -24 LUFS radio mix to -18 LUFS for podcast distribution! Open the Match Loudness window. 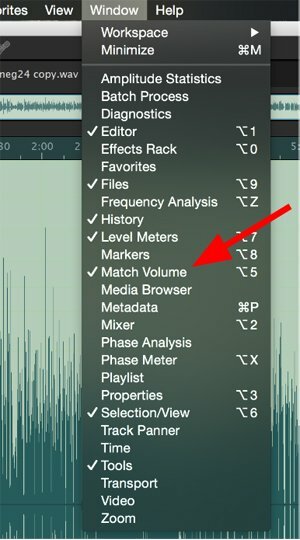 Drag your file from the File window to the Match Loudness window. 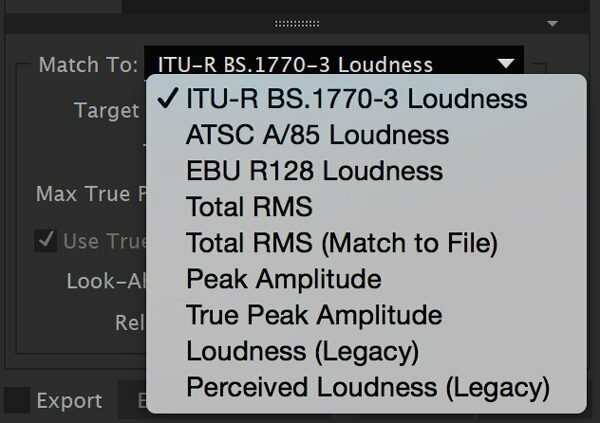 Click on Match Loudness Settings to open the setting window and choose “ITU-R BS.1770-3 Loudness” from the dropdown. Select the “Use True Peak Limiting” box if it’s not already selected. Thanks to Paul Figgiani for pointing me to the new version. There are other tools recommended in one of Jeff Towne’s podcasting articles at Transom, like Auphonic, which is definitely worth a look. Many of these tools replicate the exact same steps we just did — but in fewer mouse clicks. Also, if you can afford it, iZotope offers a couple of products that will do this step for you very easily, iZotope RX and RX Loudness Control, and their processors sound great. I highly recommend them. Rob Byers is NPR's Production Specialist. He previously worked as an audio engineer at NPR from 2003-2008 and then led part of the audio engineering and operations team at Minnesota Public Radio | American Public Media through 2016. 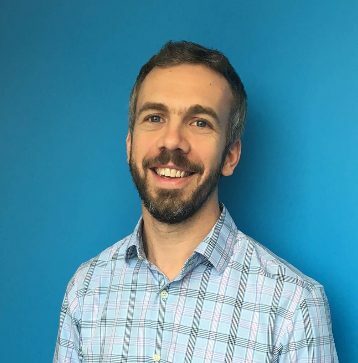 Rob joined NPR's Editorial Training Team after developing a love for education while leading trainings, evangelizing for the use of loudness technology in production, and writing articles for the likes of Transom and AIR. At MPR|APM, Rob’s work contributed to a Pulitzer and a Peabody, where he also helped produce major features from the field, engineered countless music recordings, and helped design production studios. He’s an avid cyclist, a drummer, and a lover of jazz. Email Rob at rbyers[at]npr.org and follow him @robbyers1. Well produced audio that may have been previously mixed or Loudness Normalized to -24.0 LUFS may not be well suited for significant added gain offsets. It depends on the inherent dynamics. For example, an -18.0 LUFS target will require a hefty amount of gain when the source is -24.0 LUFS. If the audio is highly dynamic, limiting will be significant. Even more so when targeting -16.0 LUFS. In some instances dynamic range reduction *before* the final gain offset (regardless of how it is applied) will optimize the the audio resulting in less aggressive limiting. In fact, in my view Spoken Word audio slated for mobile device consumption (Podcasts, etc.) will exhibit improved intelligability when the dynamics are carefully managed. I’m surely not suggesting over-compressing. The documented steps above can sometimes result in hard limiting to maintain your suggested maximum Peak Ceiling. In my opinion this should be avoided. OTOH controlled dynamics before the final gain offset will most certainly reduce the amount of limiting that will be necessary to meet the suggested target(s). I agree with Paul that hard limiting is not a complete solution here. Some moderate compression of individual elements can improve the results. I tend towards low ratios and low thresholds for those compressors, as opposed to just smashing the peaks. One possible factor for why there would be a need for separate LUFS standards for public radio broadcast: almost all radio stations have some kind of signal processing (including dynamic range reduction) between the audio program source and the transmitter. But file-based deliveries such as podcasts don’t have that intermediary between the producers and their listeners. And radio station staff should note that, when they are preparing online files for their station’s site, they need to know if the audio they are posting has or hasn’t gone through their station’s ‘air chain’. I agree with you on both counts! The workflow proposed above assumes one has already mixed their piece to -24 LUFS using good audio practices (see: http://transom.org/2015/the-audio-producers-guide-to-loudness/ ). That would include managing excessive peaks with either level automation (rubber band/volume automation) or compression. Managing levels manually in this way will yield the best sounding mix. Yes, yes, yes – stations needing to be aware of air chains and workflow when choosing a pickoff point for this process! Also, I hope I addressed your comment re: broadcast processing in the article. Yes, Rob, you addressed that nicely. I somehow missed it in my first scan of the article. Thanks to you for this piece, and to Jeff Towne for the rest of the series, and to everyone who pushed through the difficult process of getting these standards created over the past few years to tame the ‘Wild West’ conditions of earlier times. I’m now working on production for directly-distributed podcasts, as well as mixing for some public radio shows, and it’s a mind-bending (and monitor-bending!) effort to develop the two different sets of production techniques to satisfy both camps. For people venturing into using compression on individual tracks, it’s good to be aware of where the compressor fits in the flow of audio. In Pro Tools, for instance, the ‘Clip Gain’ volume controls affect the audio before the insert compressor plug-ins, while the track volume automation timeline changes the volume after the compressor. Each can be useful in achieving a consistent mix, but the effect on the sound is different. In Adobe Audition you can select pre- or post-volume insert points for the compressor. Also, Rob, welcome back to NPR! Minnesota’s loss is DC’s gain. But your work on this topic while working for each of those organizations has benefitted both of them, and the wider audio community as well. Thank you for this. Any suggestions for settings in Garageband? I am still not sure this is all very practical. I believe that iPhones/iPads offer better sound than radio except when listening to cable radio on a HIFI set. But cable radio is often compressed like crazy. Most radio programs will also be streamed and be turned into podcasts. It doesn’t make much sense to me to use different standarts when a stream can be 1, a stream, 2. radio, 3. a podcast. And now with Spotify and iTunes Music using their own loudness norms, it gets even more fuzzy. What happens when Spotify streams your podcast? Well Spotify uses a loudness norm of -12 LUFS. And there’s still this big one: the loudness norm you use has nothing to do with dynamic range. So you can make a -24 LUFS track sound dull and undynamic and make a -16 LUFS, or any other higher norm, sound lively. That’s just a matter of using compression. So in a way this level setting, this norm, is still causing issues and that is: loudness perception. Right? If you don’t have peaks, a -12 LUFS tracks can be translated to any other NORM without the limit anything at all. So in theory, for example, a well compressed -12 LUFS track can be translated to -24 LUFS without changing anything about the dynamics, only the level. Which in fact is a little silly because why adding LESS signal to noise? In my opinion too much dynamic range is unpractical when doing radio or podcasts. It’s very much needed to do some very controlled vocal riding / compression. It’s important to do that since people listen to these podcast conversations outside where streetnoises are loud enough to disturb the conversation or in a car, so the voice needs to be at a steady level. This can be done without creating a compressed sound using modern tools. Some people have advised me not to worry about using a norm. So not use AES metering systems when mixing, simply mix what sounds right and only set the level at the end of the process. In the end it is just a level and has nothing to do with dynamics. Check S-Town. Voices seem to be around -23 LUFS Short Term and a limiter seems be used to limit the dynamic range. So it’s not super dynamic (dynamic enough to keep it lively and yet easy to listen to) and put to a lower overall level. And if you used Hindenburg Journalist PRO you could do all that in just one step with the built-in tools ;). How would this be done in Audacity? It uses the DB scale rater than LUFS, and there appears to be no way to change that. Or is there a DB equivalent? Or am I just confused?